This list of prerequisites does not include the key concern of myself and others; that the research proposed was to specifically evaluate the efficacy of Swisse products. Do we really want University researchers to spend their time assessing the efficacy, for example, of Swisse Men’s Ultivite which contains 52 “premium quality vitamins, minerals, antioxidants and herbs” in a potpourri of ingredients many of which lack logic (and are present in non-standardised, sub-therapeutic amounts)? These ingredients are presumably included in the hope that “more is better” has marketing appeal. There are many worthwhile complementary medicine questions to be researched such as exploring the efficacy of certain traditional medicines (from which many useful active pharmaceuticals have been derived). 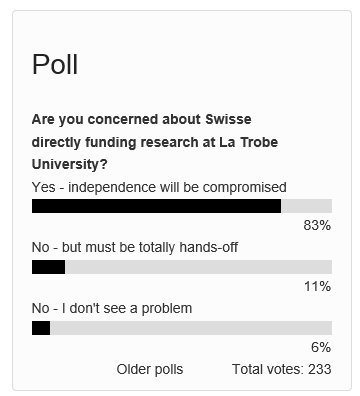 However, that was not what the Swisse – La Trobe MOU (as announced) proposed. The top 10 patent protected drugs that are prescribed by doctors in Australia all rely on efficacy from research that was industry funded. This is absolutely no different to what Swisse is aiming to do, with the support of additional industry players, government and other financial backers. Not true! Most research on product efficacy by conventional pharmaceutical companies is undertaken prior to marketing and is used as part of an application for product registration where it is independently assessed by regulators such as the Australian Therapeutic Goods Administration (TGA). Swisse products are listed by the TGA; a process that requires no pre-market evaluation of efficacy. However, the sponsors of listed products are meant to hold purity, safety and efficacy data for potential audit, compatible with the product labelling and advertising claims. So if a company needs to find this evidence after marketing it would seem that their listing claim must be dubious. Given that Swisse does not hold patent protection for any products to be researched, it means that the entire nutraceuticals industry can benefit from the research findings. Swisse (and other supplement company) products usually contain a unique mix of ingredients, for example the Swisse Men’s Ultivite F1 contains “52 premium quality vitamins, minerals, antioxidants and herbs”. Results found from trials using Men’s Ultivite F1 cannot be extrapolated to other multivitamin, mineral and herb products (unless they had an identical formulation) and thus other supplement companies cannot benefit from such research. The Australian Integrative Medicine Association (AIMA) has publically stated itself that the attacks from the Friends of Science are hypocritical. Dr Harvey advised last September that he intended to retire from all “watchdog activities”, suggesting that his recent retirement announcement from La Trobe, citing concerns over the Complementary Medicine Evidence Centre (CMEC), could merely be seen as yet another publicity stunt for a final farewell. While it’s true I had intended to retire later this year, following publicity about the Swisse-La Trobe MOU I’ve had had many requests to keep on keeping on. In addition I’ve also received also an offer of an Adjust Assoc Prof appointment at another university that refused the Swisse offer. Accordingly, I’ve accepted the latter and postponed my retirement. Swisse will be pleased to know that I have more complaints about the promotion of complementary medicines (and the ineffectiveness of the regulators) currently in train. Swisse have claimed that a number of their products were “proven”, “clinically proven”, “scientifically shown”, “clinically tested with proven results” and “proven in clinical trials”; claims that the independent Complaint Resolution Panel (CRP) found breached the Therapeutic Goods Advertising Code, see: http://www.tgacrp.com.au/uploaded/doc/Swisse_Products.pdf . In my view (and that of the CRP) these “semantics” are important and the Swisse distortion of previous research results for marketing purposes was another concern about the research proposed. Regrettably, the CRP has not got the power to “fine” companies who breach the Therapeutic Goods Advertising Code. … let’s celebrate the success of an Australian company that is making millions more people happier and healthier around the globe. With some important exceptions, there is little evidence that the majority of people who consume complementary medicines are made happier and healthier as a result. Most consumption would appear to be driven by hype and celebrity endorsement; not by evidence. This entry was posted in Complementary medicine, Natural Therapies, Pharmaceutical Promotion and tagged CRP, La Trobe University, Swisse, Therapeutic Goods Advertising Code. Bookmark the permalink.